- Robin Parisotto, a scientist who developed a new EPO test for the 2000 Sydney Olympics that snared 7 drug cheats. Unfortunately, the IOC has kept the names of the 7 cheats secret until this day. Our take - RELEASE THE NAMES NOW!!! Should/Can I Buy A Horse and Ride It Each Day To The Office/ XC Practice? Haile G Remains Undefeated as Adere Repeats!! *LRC Thread on Race Haile G still has got the goods as he put on a great show and crushed the field in poor conditions in England. 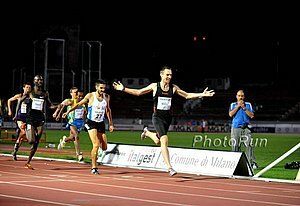 He remained undefeated in 210 and won by almost 2 minutes in 59:33 as American Dathan Ritzenhein was 4th in approx 62:34. 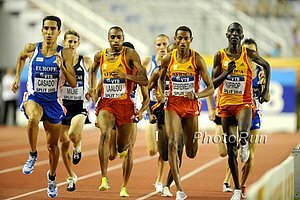 *Haile G's Undefeated 2010 Season Continues Sunday In Britain In addition to Ritz, he'll also be facing former world 5,000-meter record holder in Sir Chris Chataway. Philly: LRC Matthew Kisorio Slays Gebre Gebremariam As Ryan Hall Struggles 5k man Matthew Kisorio showed that Gebramiam is beatable afterall but it takes a 4:24 3rd mile to do it. Ryan Hall was never a factor and struggled mightily (63:55) as Brett Gotcher (62:50) was the top American but he was beaten by former NCAA runners Simon Bairu, Alistair Cragg, Wesley Korir and Shawn Forrest. LRC Meseret Defar Wins as Shalane Flanagan Runs 68:36 2004 Olympic 5000 meter champ Meseret Defar's move up to the half marathon was a successful one as she defeated the hottest road race on the planet in a sprint finish to get the win as Shalane Flanagan became the 4th fastest American in history.